Let me start by saying that I have never owned a Fanatec product, so any opinions I give here are gleaned from the Fanatec website and things I’ve read and heard about their products. Fanatec offers a wide range of racing wheels. You can choose your components a la carte and frankly, it can get a little bit confusing. On the other hand, you can buy a Fanatec bundle which keeps it simple, but that also has a downside. It seems that most of the bundles come with the low end Fanatec CSL Elite pedals, and I’m not really impressed with them. If you want a good Fanatec setup, you’re probably going to have to spend somewhere around $1000 for that. If you need a table clamp, add another $50. I put together a bundle consisting of the ClubSport Wheel Base version 2.5, the lower end CSL Steering Wheel P1 rim, and the ClubSport Pedals V3. My total came to $890. No shifter, no table clamp. Add $50 for a table clamp and $50 for shipping and now I’m at $1000. Is it really worth it when I can get a Logitech G29 for around $250? I don’t know. I will add here that the Fanatec table clamp, unlike the abysmal clamp provided by Thrustmaster for their wheels, is of full metal construction and has two clamping bolts as opposed to one. It also included a removable angle adjustment plate. You can use the plate to adjust the angle of the wheel or you can remove the plate and use the clamp without it. Maximum table thickness with this clamp is about 2.75 inches (7 cm). The CSL Elite Starter Kit for PC and Xbox One at $460. The CSL Elite Wheel Base and CSL Steering Wheel P1 rim appear to be okay. In fact, as an dirt/oval racer I think I would prefer this rim as it’s very light (good for reaction time) and it’s almost 12 inches in diameter, which is a pretty big racing wheel. I might go for an upgrade on the wheel base though. The CSL Elite Pedals have no clutch. They really don’t look that great on their website but they are all metal (brushed aluminum). I can only assume that the brake operates on spring resistance and activates a potentiometer. For ovals you really don’t need a clutch but a load cell brake is good to have. You can upgrade the brake to load cell in these pedals and add a clutch as well. The CSL Elite PS4 Starter Kit for PC and PS4 at $500. This bundle appears to be pretty much the same as the one above aside from the obvious console compatibility difference. The CSL Elite Wheel Advanced Pack for PC and Xbox One at $600. This bundle is similar to the two above except that the CSL Elite Pedals are the LC version which has a clutch added and also a load cell brake. The rim is also upgraded to the Elite version of the CSL Steering Wheel P1. Look at the Fanatec website to see if you can tell the difference between these rims. I see changeable button faces and some different sort of paddle shifters on the Elite version, but I don’t see any significant improvements. The Xbox One Competition Pack at $680. This bundle includes the superior Clubsport Wheel Base V2.5 and the Elite version of the CSL Steering Wheel P1. Unfortunately, it only has the low end CSL Elite Pedals with no clutch and a spring resistance brake, so no load cell with these without an upgrade. The Forza Motorsport Wheel Bundle for PC and Xbox One at $1300. 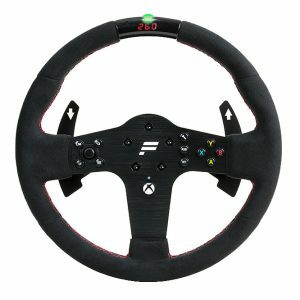 This bundle has the same wheel base as the one above, but uses a different rim, the “Official Forza Motorsport Racing Wheel.” It has an odd shape and I would prefer a round racing wheel myself. On the other hand, this particular rim has a lot of option with button placements and it’s also a whopping 13 inches in diameter. This bundle also includes the Clubsport Pedals V3 which I recommend if you’re going to invest in a Fanatec racing wheel. It also includes the Clubsport Shifter SQ. The shifter is solid metal and includes both H-pattern and sequential shifting. You can switch shifting modes on the fly. Personally, I would build a bundle myself. I don’t need a super fancy rim for oval and dirt. I do need good pedals and load cell braking, and a good smooth wheel base. You will have to spend more for a Fanatec racing wheel, but it might be worth it.